With runners at first and second and two down in the first Shane Victorino. There was adventure and excitement when Andy Pettitte uncorked a wild pitch to Jonny Gomes. Victorino tried to score when he noticed Pettitte didn’t cover home plate but lost to Francisco Cervelli in the race to the plate. An early run may have put the pressure on the home team but instead the Red Sox didn’t score until the seventh inning. Jackie Bradley, Jr. notched his first extra base hit, a gapper that plated Will Middlebrooks. But Bradley also was the last out of the game, getting called out on strikes with runners at the corners and Mariano Rivera on the hill. In a face-off between a rookie and a future Hall of Famer, guess who gets the call? 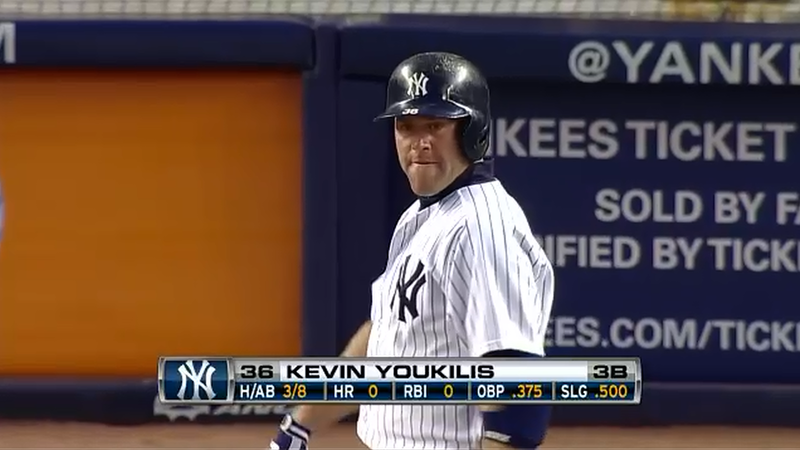 Jerry Remy mentioned that Kevin Youkilis said that after losing the series no media came to his locker. Perhaps it’s because he’s not a true Yankee yet.